“People think that there’s all kinds of waving and yelling and carrying on, when in fact the victim is pushing down on the water desperately attempting to keep their head above the water,” said Pratt. Pratt says people drowning should flip, float, and follow. “Follow the safest course back,” said Pratt. 04/19/2016 – News Net 5 – Kayaker Pulled from Lake Erie – According to the Great Lakes Surf Rescue Project, eight people have been rescued in Lake Erie since Saturday. Seven people were rescued Saturday when a distress call came in from a boat with two downed engines. The boat was taking on water about a mile northeast of Mouse Island. The Great Lakes Water Safety Consortium is hosting a Great Lakes Water Safety Conference Tuesday from 8 a.m. to 4:30 p.m. at the Lake Erie Nature & Science Center, located at 28728 Wolf Road in Bay Village. 05/12/2015 – WCIU “The U” – You & Me This Morning segment – “Power of the Surf – Water Safety. 05/11/2015 – TMJ4 – Port Washington schools using proactive approach to promote water safety – In schools today there’s fire drills, tornado drills, school shooter drills, earthquake drills in some states and very little water safety education. Numbers show more school aged children will likely die from drowning than a fire, tornadoes and school shootings combined. The group will hit up six states over the next six days teaching students how to keep themselves safe. 06/05/2014 – 19 Action News – Mom’s grief turns into useful initiative for community (with Melissa Zirkle). 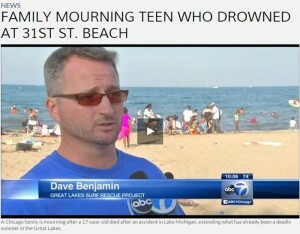 07/25/2013 MLIVE – What are tips for keeping kids safe in the water? 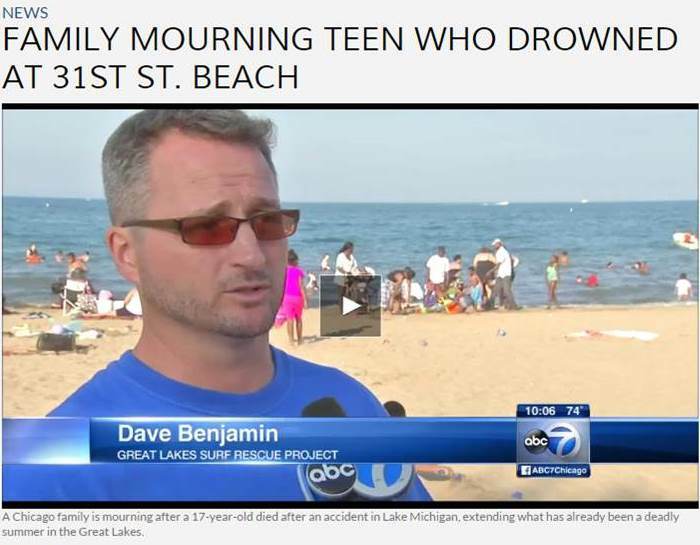 07/24/2013 MLIVE – What should I do if I start to struggle in water? 07/02/2013 WZZM – Who is most likely to drown in Lake Michigan? 05/30/2013 WNDU – Should beach safety be part of school curriculum?